Of course, one of the first things your insect pet needs is an enclosure. This can be basically anything, when the specific needs of your insect of choice are met. You can house your insects in one of the following enclosures: glass terrarium, old aquarium with lid, net cage, cage, plastic box, faunabox, plastic cup with lid or even a complete room in your house! Make sure the enclosure of your choice matches the needs of your pet on the following criteria: correct size, escape proof, well ventilated, humid, the correct temperature and safe. I’ll explain that here on this page. Of course the size of the cage or container should be matched to the size of your pet insect. A young praying mantis nymph needs a smaller container than an adult mantis. The same is for keeping stick insects. 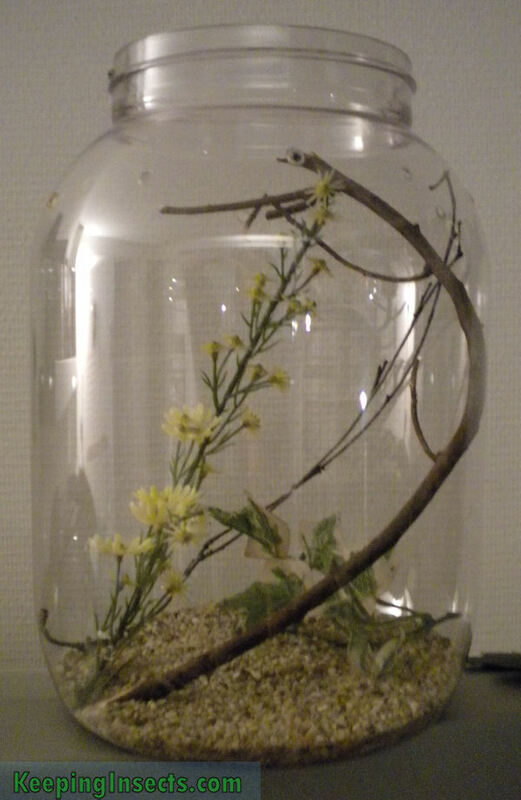 If you need a container for a group of stick insects, you need to look for a larger terrarium than if you keep just two. Because the size of each insect is different, you will find more detailed information on the follwing pages: Housing a Mantis and Housing Stick Insects or Housing Caterpillars and Butterflies or Housing Beetles. Please do read the current page, as it gives you detailed information about safe and healthy housing for ALL insect species. Your pet should not be able to escape your enclosure. For most bugs this means the enclosure needs a lid, as many insects are able to walk onto vertical glass surfaces or are able to jump or fly. Make sure the mesh or gauze you use for the enclosure is fine enough not to let the bugs escape; especially newborn stick insect nymphs are able to fit through small holes and slits. Unexpected escapes and the subsequent meeting with the family cat or an unsuspecting shoe are a main cause of death for pet stick insects and mantises. 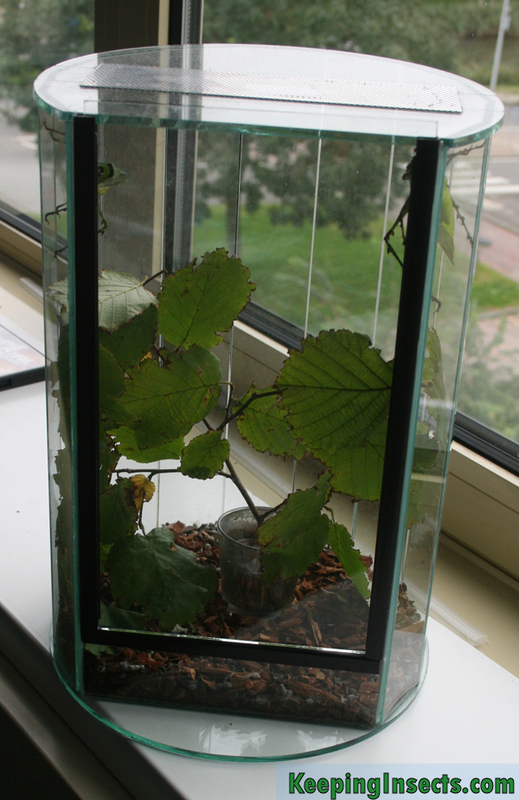 A possible enclosure for a praying mantis. On top should be a lid. Like all animals your insects need fresh air (oxygen) to survive. Therefore the enclosure needs to be ventilated by one or more mesh or gauze surfaces. Ventilation also helps to reduce humitity in the enclosure; therefore adjusting the amount to ventilation will also adjust the humidity in the enclosure. For most insects the balance between ventilation and humidity is crucial for their wellbeing. The enclosure of your pet insect should be able to sustain an appropriate temperature for your pet. Glass enclosures are easily kept on higher temperatures than their surroundings, because heat is trapped easily behind glass. Enclosures made of mesh generally adapt to the environmental temperature very quickly, so are hard to keep warm. To read more about maintaining the appropriate temperature, read our page “Temperature“. Of course the enclosure should be safe for your pet. The safety points mentioned here are the most common hazards for insects pets, so be sure to check them before putting your pet insect in the enclosure. None of the objects in the enclosure should be able to fall on top of the insects.